Oh YUM! This cookie is like a peanut butter shortbread with a Reeses Miniature in the middle. Preheat oven to 375°. With electric mixer, cream butter, peanut butter, sugar, and brown sugar. Mix in egg and vanilla. Add flour, baking soda, and salt. Mix in mini chocolate chips. Mixture will be crumbly. Using cookie scoop, press mixture into scoop to pack into a ball and drop onto cookie sheet. Bake for 8-9 minutes, no more. While cookies bake, unwrap the Reeses candies. 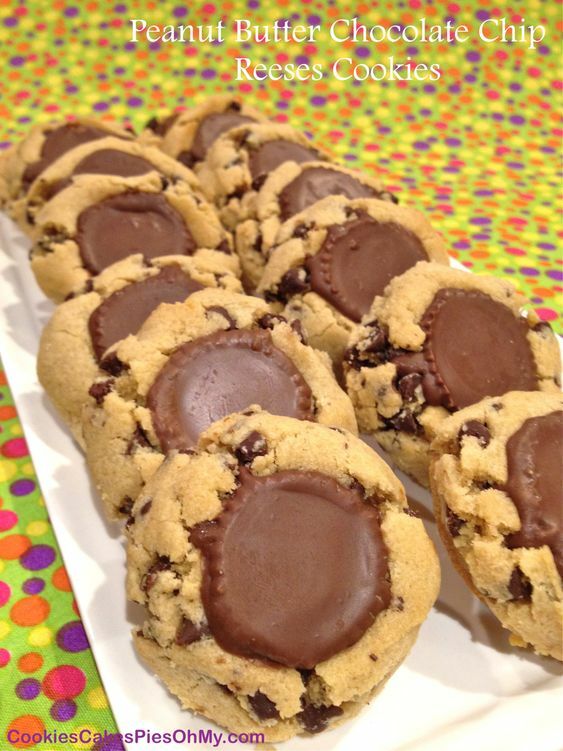 Right as cookies come from the oven, press a Reeses miniature half way into the center of each cookie. After you get the last cookie, go back to the first cookie and press the Reeses farther into the cookie (the bottom half of the Reeses that was in the cookie will be soft and melting and allow you to push it deeper into the cookie). As you push the Reeses deeper into the cookies you will need to use your fingers around the cookie to push the cracks back together. Continue with all cookies on the sheet, working quickly before the Reeses are too melty to touch. This is a little tricky but so worth the end result. Let the cookies set up on the cookie sheet for about 10 minutes, then put in the refrigerator until the Reese are solid again. Makes about 36 cookies. 0 Response to "Peanut Butter Chocolate Chip Reeses Cookies"